It would be better if you make one ANN thread and one Bounty thread because there will be a lot of bounty posts and investors will have problem to find the necessary information. @ICHIBA, where's the avatar? I do not have telegram! In relation to this project of connecting fundraisers will it succeed? The market is not hot today, there are many challenges. Presale right now is only for Masternodes. You will be able to buy coins less than 5000 ICA by our website within couple of days. We already have couple of nodes sold out! The appropriate link has been re-instated! Ehe site does not contain information about the team.Just can't buy a master node-click on the link-nothing happens.How many coins do I need and where can I buy? You will soon be able to buy directly from the link from the 28th onwards. 5000 ICH is the collateral for the masternode! Yes,well, I have already seen. I will say my opinion-the price is clearly too high.$ 0.60 too much-what's the price?Have you incurred significant expenses? Guys-I understand the new draft,a lot of work-but why such a weak support in diskord? Sorry-but it's just disrespectful to remain silent in response to questions. At least answer the questions of the participants.Otherwise who will come to you? I see that there are channels for generosity - everything is quiet.If you really have serious intentions for the project-so let's get to work, shall we? We are looking to automate everything so that all operations will be independent. We are now hosted at https://pecuniaplatform.io/ which supports single click masternodes. You can almost set it up with a single click of a button. Further more, shared masternodes services are coming along. One more service https://ihostmn.com/hostmn.php?coin=ICA for masternode hosting has been added. This project has a rather interesting and unusual concept. When is the launch of the crowdfunding decentralized platform? What a new and interesting project I discovered for myself. I will monitor the development of project Ichiba and the implementation of their ideas. In my opinion, an interesting and sought-after idea to support entrepreneurs to provide funding for innovative projects. In addition, the project Ichiba checks each project on its platform so that everything meets the requirements. This is very important in our time. 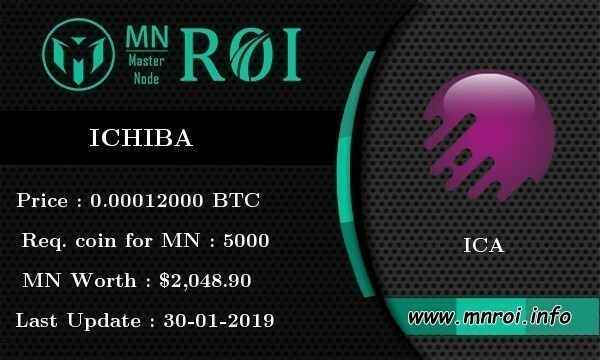 Ichiba is a blockchain-based, crowdfunding decentralized platform which uses smart contract technology to create a seamless, efficient way to raise money for new fundraising campaigns. Fundraising campaigns are used to help support entrepreneurs and leaders on their quest to see their innovative projects fully funded. I like what these guys are going to do. It is possible that exactly what the crypto industry lacked in recent years. I have a question on the company's bounty: will there be a requirement for participants in the bounty to go through the user verification procedure (KYC)? How to participate the airdrop? The airdrop hasn't started yet wait for further announcements. Do you have plans to hold an airdrop? It is very cool! I think that there will be many who want to receive coins of your promising project.